After revealing the Top 16 Men of 2016 yesterday, now it’s time to analyse the best-performing women of the year. It’s been an interesting season for the women’s sport, with some absolutely incredible performances from amazing athletes in exciting races. But at the same time there’s been a noticeable lack of growth in participation at the elite level relative to the men, which makes producing an accurate world rankings and authoritative power list somewhat difficult. There are far fewer women regularly competing at the big races compared to what we see in the men’s sport, which makes head-to-head comparisons between all the top athletes almost impossible. So while the Top 16 Men of 16 followed the world rankings fairy closely, there’s a much bigger divergence between the Women’s Top 50 leaderboard and the Top Women 16 of 2016, at least outside of the top five (athletes that don’t compete regularly take a big penalty on the rankings, however I’ve been far more lenient and focused more on one off results with this power list). But why aren’t more women competing at the top end of our sport? Is it the lack of prize money? (I’m sure that plays a role); Lack of sponsorship dollars? (possibly); Lack of media exposure? (perhaps); Are the ‘elite races’ seen as more intimidating by women than men? (that’s one theory). Most likely it’s a mix of everything. Six months ago, we looked at how there are 3.8x more men in elite races than women. For some more context: 55 men reached the ‘best five results’ threshold on the SUP Racer World Rankings in season 2016 (the minimum necessary to get a relatively accurate ranking). That’s how many guys you could loosely say are “on the tour,” if there was such a thing. By comparison, only 21 women have five or more results, and at one point during the season that number was as low as 12. At the pointy end of the sport it’s even more extreme: 24 men have 9x or more results compared with just 7 women, which almost perfectly mirrors that 3.8 ratio above. There are positive signs for the future growth of women’s SUP racing though. While the current stars are continuing to push the boundaries of performance, there’s also a new breed of young guns in places like Southern California, Hood River, Hawaii and Europe punching way above their weight and getting ready to take the sport to new levels over the next decade. You only need to look at the great performances from the likes of Jade Howson, Kali’a Alexiou, Erika Benitez, Hannah Hill, Lexi Alston, Annie Reickert, Lara Claydon and many more up-and-coming teenagers to feel reassured about the future, while names such as Fiona Wylde, Shae Foudy and Manca Notar are already well established. Season 2016 was an interesting one for Annabel, with the fastest woman in the world winning some of the biggest races but also slipping a couple of steps on the podium at others. But while she couldn’t overcome Sonni at Molokai and threw away her shot at a PPGs crown with a total brain-fade in the final moments, Annabel showed more than enough form to prove she’s still on top. Her two most impressive victories came at Carolina and Doheny. In the former, Annabel paddled clear of a hugely competitive field to win by more than five minutes — an astonishing gap considering the level of talent that was chasing her. It was also her fourth-straight Carolina title. And while she didn’t win the Pacific Paddle Games overall crown, her very big win in the distance race mirrored her performance in Carolina and showed that no other woman can stick with Annabel Anderson when she’s on her game. The New Zealander also saluted at the Gorge Paddle Challenge ‘Super Lap’ race, meaning she earned a win at the three most competitive events of the year. Highlighting her strength and consistency is the fact Annabel never finished outside the podium all season, a distinction no other female athlete can claim. Candice had an incredible season in 2016, taking a couple of huge wins and almost reeling in her Kiwi rival on the world rankings leaderboard. The SoCal superstar defended her Pacific Paddle Games title and then backed it up six weeks later with a gold medal in Fiji, showing that her and Annabel are still the dominant forces in women’s racing despite a new wave of contenders rolling through. But while there were some big victories, there were also a few misses, with Candice off the pace in Japan, at the Gorge downwinder and in her pet surf race event at the ISA Worlds. Candice was still very consistent this year though, finishing runner-up at four other big events including the hugely competitive Carolina Cup and Gorge Paddle Challenge ‘Super Lap’. If she still has the fire and motivation in the new year, which I strongly believe she will, Candice Appleby will be a very hard lady to beat for a long while yet. The Queen of Molokai retained her crown and set a record of three-straight victories in the world’s most prestigious paddleboarding race. No other woman or man has ever matched that feat. Sonni also defended her EuroTour title, proving she’s the Queen of Europe as well. Victories at OluKai, the SUP World Cup and a strong finish at Carolina showed the German powerhouse is simply too strong for almost all of her rivals when the grind is on. Sonni went missing at a few events, including the Gorge and PPGs, but when all things are equal there are very few ladies that can hold her pace. Sonni is one of the nicest and mellowest athletes off the water, while her new deal with Mercedes-Benz should give her added motivation to continue competing at the top for several years to come. Fiona certainly had a big season in 2016, claiming the single most competitive women’s race of the year, the Gorge Paddle Challenge ‘Double Downwinder’ at home in Hood River, Oregon. Her crushing dominance of that race, where she gapped world number one Annabel Anderson by five minutes and left the rest of the world’s best even further behind, showed that nobody can match this young gun on her home court. Fiona also had some great results in Europe and took out the World Series title for the first time, though not a lot of the top women were competing so it’s hard to use that as a gauge. Perhaps the best snapshot of Fiona’s place in the pecking order came at Carolina, where she fought hard and stayed with the main pack the whole way before finishing 4th — the same spot we’ve awarded her in the Top 16 of 2016. As the most-traveled female athlete in the sport, expect to see this pocket rocket atop plenty more podiums in season 2017. Shae had some incredible performances in season 2016, challenging Candice for the honour of ‘best surf race athlete’ in the sport by taking out the JM Survivor Race at Huntington, the Santa Monica Pier Paddle and going oh-so-close at the Pacific Paddle Games. The fact she never competed outside the States made it harder to compare her to some of the other top ladies this season, but from the form she showed at home, it’s safe to say Shae Foudy has a long career in the ocean ahead of her. Olivia was the surprise packet of 2016 and probably would have ended up even higher on this list if she’d made it to all of majors in the States. 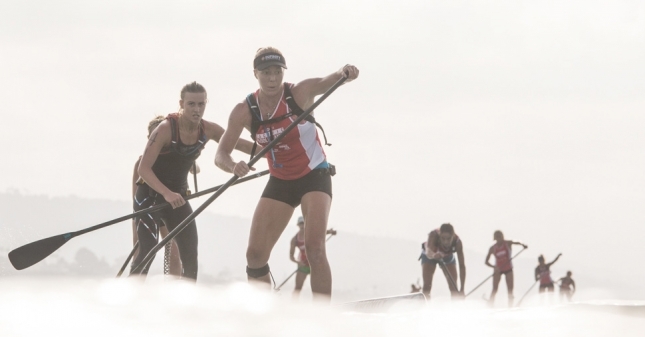 After taking a year and a half off, the Frenchwoman came back looking fitter and faster than ever this season, absolutely dominating at home and holding her own on the biggest stage of the year at the Pacific Paddle Games. However it was her performances in Fiji – where she claimed the silver medal in both the surf race and marathon to help guide France to a runner-up finish on the overall team standings – which really cemented her place on the top tier. Her strength in the South Pacific showed that Olivia is one of the strongest/fittest/fastest women in the world right now, and if she continues to improve into season 2017 watch out. Angie was a tough one to rank this year simply because she missed almost all of the big races. The Australian was absent from Carolina, the PPGs, Europe, Hawaii and the Worlds this season, however she showed enough when she did race to keep her spot well inside the top 10 for another year. While she picked up a few wins along the way, including an impressive overall victory against Fiona and Candice in Japan, Angie’s biggest result was certainly the 3rd place at the Gorge Double Downwinder, aka the most competitive women’s race of the year (and perhaps all-time). With a new board under her feet and a training regime few other women can match, look for Angie to continue fighting at the front of the pack in season 2017. After conquering the ‘Everest of paddleboarding’ and winning Molokai in 2013, Terrene went through a couple of rough seasons, as she describes in the insta caption below. So the simple fact that she’s back competing in the elite women’s events is a great sign; the fact she’s often challenging for the win, as Terrene showed in Hawaii during Downwind Month, is a huge bonus and well deserved reward for her hard work, dedication and determination. As the current Guinness World Record holder for ‘distance paddled in 24 hours’, Seychelle is very hard to match in the long, flat, endurance type of events. And there’s nothing longer and flatter than the SUP 11 City Tour, where Seychelle defended her title and added to her two other victories in Europe a few months prior. The Floridian still has some work to do in the ocean and surf race events, but Seychelle is clearly one of the fittest and most determined women in the sport right now, so I’ll be surprised if she’s not sitting higher on this list in 12 months’ time. How much weighting can you put on one single race? And where do you rank a paddler that won a gold medal at the ISA Worlds but didn’t compete at any other major event all season (which explains why she’s not in the the 20 on the world rankings)? It would be hard to leave a current world champion off this list, even if she did only compete at a handful of races all year, but it’s also hard to know exactly where to rank Penelope Strickland. In Fiji, Pea showed her supreme strength and skill to win gold in the surf race, defeating defending champ Candice Appleby and French powerhouse Olivia Piana in the process. The Kiwi was a little further back in the marathon two days later but all of the women who finished ahead of her are also on this list. So while her spot in the Top 16 of 2016 is hard to question, I really hope Pea gets the opportunity to travel and compete more in season 2017, because I’m sure she would be ranked even higher if she did. Karla is in a very similar position to Penelope above — one big victory and signs of world-class form but otherwise a very light international race season. The former Queen of Australian surf life saving (I grew up watching Karla race on the telly) showed she can still go toe-to-toe with the top ladies by earning Team Australia a medal in the Fiji ISA Worlds surf race, however Karla’s biggest result came at home a few weeks later. With defending champ Angie Jackson and former Molokai champ Terrene Black to contend with, Karla reclaimed her title of Australia’s #1 ocean paddler, charging home to win the prestigious King of the Cut downwind race earlier this month. And she won by a very solid margin too. Just like Pea, I really hope we get to see Karla competing a lot more next season because she’s clearly still in amazing form. Laura totally flew under the radar in Fiji but had one of the strongest performances of the event: The Spaniard showed remarkable strength and endurance to claim a bronze in the long, hot, flat and very draining marathon race from Cloudbreak to Musket Cove. The Mallorca local, who helps run the biggest junior training program in Europe at the Mar Balear SUP Club (hosts of the excellent Port Adriano Race in May), also had some solid results in Europe over the summer. If she keeps training and gets an opportunity to travel, I’m sure we’ll see Laura on plenty more podiums in season 2017. Although she didn’t get an opportunity to compete and show her talents at many of the big international races this year, when she did race Manca showed glimpses of why she’s been one of the top junior prospects in the world for a few years now. The Slovenian pocket rocket had some solid results in Europe and defeated many of the world’s best to finish 6th at the most competitive race of the year (and perhaps of all time), however her season-defining result came in her final event: The Fiji ISA Worlds long distance race. Despite the searing conditions that would be at extreme odds to her home nation of Slovenia, Manca out-paddled several far more experienced and stronger-built athletes to claim a hugely memorable copper medal for her country. The mental and physical strength Manca showed in the South Pacific highlight the fact she has a bright future if she wants to keep pursuing it — the young gun is also studying a chemistry degree at university that sounds so complex I’m wondering how she finds time to even train anymore. I hope the youngster gets the opportunity to compete more in 2017 though, because if she does Manca will almost certainly be a lot higher on the Top 17 of 2017. Proudly flying the flag for the East Coast of America, April is one of the true characters on the women’s circuit. But don’t let her friendly nature off the water fool you, April is a machine once she steps on her race board. The Wrigthsville Beach local (April lives around the corner from the Carolina Cup start line) had an extended tour of Europe and also snagged top ten results at the Gorge, in addition to her hard-fought 8th place result at home. "Work so hard your idols become your competitors" So #honored and #happy to #race #strong against some of the finest ladies this sport has ever seen. Helping lead the charge for the youth brigade in SoCal, Jade Howson is certainly a name to watch in the future. Jade went toe-to-toe with her fellow young gun (and an athlete who will almost certainly be on the Top 17 of 2017 along with her) Kali’a Alexiou, before stepping up and competing in the big leagues against the world’s best women. The 14-year-old clearly wasn’t intimidated though, rocketing off the line to take an early lead in the women’s surf race final as the likes of Annabel Anderson, Candice Appleby and a dozen more of the world’s best gave chase. Jade eventually settled for a 5th place finish, but her spirited performance showed there are clearly big things in store for this junior prodigy. Hannah is another one of the young women that are helping pave a very bright path forward for the sport. The Hood River local didn’t have a busy race season but one result clearly sticks out: Her epic 4th place finish in the Double Downwinder at the Gorge Paddle Challenge, where she left several of the biggest names in the sport in her wake. Just like her fellow Hood River regular and team mate Bernd Roediger did in the men’s event, Hannah’s result became one of the stories of the weekend. She also finished 13th overall at the PPGs, giving her two very solid results at the two biggest races of the year and proving she’ll be one to watch for many years to come. So there you go. Those were the top 16 women of 2016, at least in my opinion. Did I get it right? Probably not. This kind of thing is highly subjective, and with the fragmented nature of the women’s sport, even the statistically-based SUP Racer World Rankings probably won’t ever be perfect. There were also probably a few names unlucky to miss out (sorry, Susak! ), however that’s a great sign for the women’s sport: I didn’t have trouble finding athletes to fill this list with, I had trouble deciding who not to fill it with.